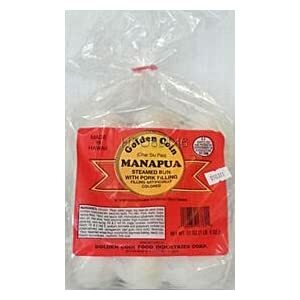 For those of you who crave manapua or Hawaii's version of char siu bao, this is a fairly involved recipe, but it is worth the effort if you miss manapua and can't get it in your local asian market or from Hawaii. Sprinkle yeast over 3 tablespoons water and allow to stand until yeast softens. To remaining water, add oil or shortening, sugar and salt, stirring until melted or dissolved. Cool. Add yeast mixture. Place flour in a large mixing bowl or a heavy-duty mixer and add most of the liquid. Begin kneading. Add remaining liquid to make a very heavy dough. Continue kneading or mixing until you have a smooth ball that is beginning to show signs of long strands on the outside, indicating that the gluten has fully developed. Remove dough from bowl and rinse out bowl. Pour sesame oil into bowl, return dough and turn it around until covered with a thin layer of the oil. Cover with plastic wrap. Allow to rise until double in bulk -- about an hour in a warm room. Placing the dough in the refrigerator and allowing it to rise there, 3-6 hours, develops the flavor. Proceed with the filling or gently deflate the dough and allow it to rise for a second time, which will further enhance the flavor. If you are using store-bought char siu....In a pot, stir cornstarch, sugar and salt in water until dissolved. Bring to a boil, reduce heat and simmer 1 minute, stirring constantly. Add char siu and, if desired, red food coloring. Heat a steamer with plenty of water. Cut 12 (3-inch) squares of waxed paper and coat 1 side with 1/2 second coat of nonstick cooking spray. Punch down dough and divide into 12 pieces. Roll each into a ball. Flatten into a circle about 6 inches in diameter. Make the dough as thin as you can and try to keep the edges thinner than the center. Place the circle of dough in the palm of your hand. Spoon in a couple of tablespoons of filling, cupping the dough around it. Then, with the thumb and finger of the other hand, pinch the edges of the dough as if you were making a fluted edging on a pie crust. Pinch the folds together, twisting them as you do so. Place the completed manapua on a square of greased waxed paper. Allow to plump up into a globe with a taut exterior. Place in steamer on their squares of paper about 1 to 2 inches apart. Cover and steam vigorously for 15 minutes. If using a metal steamer, place a folded tea towel across top of steamer, holding it in position with the lid. This will prevent steam from dropping onto manapua. If using a bamboo steamer, this is not necessary. Remove steamer from heat, let stand 5 minutes, then open.